The Criminal Law Initiative is designed to illuminate career pathways in criminal law and policy for GW Law students and alumni, and to promote academic inquiry, professional engagement, and scholarly research on cutting-edge criminal law issues. 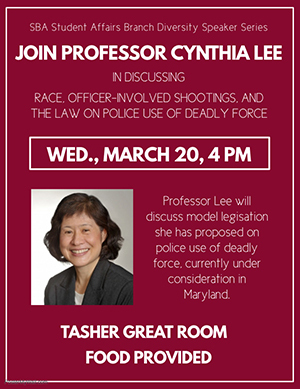 The Criminal Law Initiative hosts many events throughout the year. Check back frequently for new events. 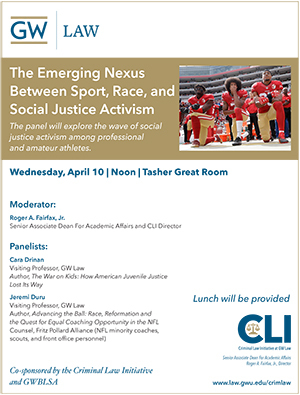 The Criminal Law Initiative held a panel discussion on the wave of social justice activism among professional and amateur athletes. 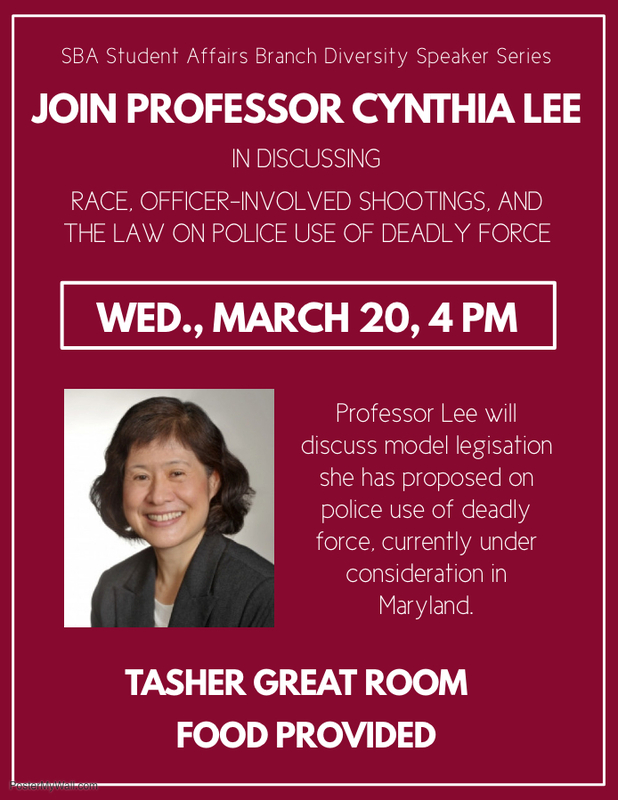 The SBA Affairs Branch Diversity Speaker Series hosted Professor Cynthia Lee who discussed model legislation she has proposed on police use of deadly force, currently under consideration in Maryland. 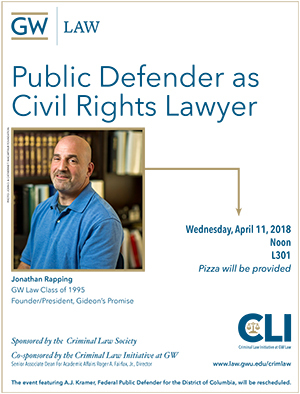 The Criminal Law Initiative, the Career Center, and the Criminal Law Society hosted Jon Rapping, JD '95, Founder and President of Gideon's Promise. 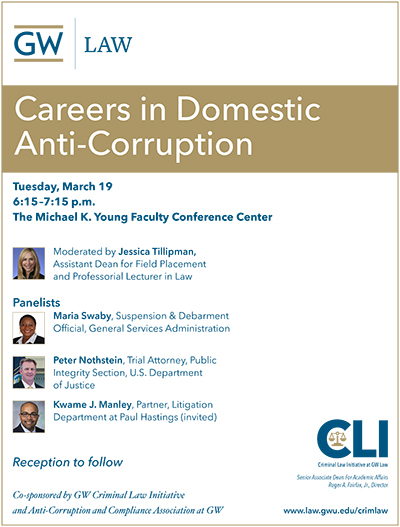 The Criminal Law Initiative and the Anti-Corruption and Compliance Association held a panel discussion on various careers in the anti-corruption field. 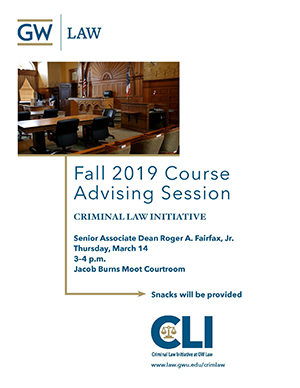 The Criminal Law Initiative held a Fall 2019 course advising session with Senior Associate Dean for Academic Affairs Roger A. Fairfax, Jr. 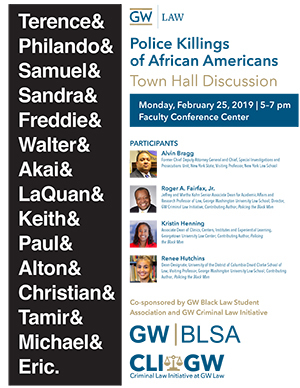 The Criminal Law Initiative and the GW Black Law Students Association hosted a discussion on the killing of African Americans by police in recent years. 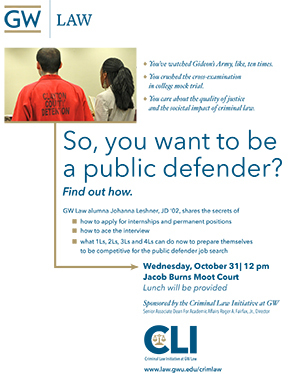 So, You Want to Be a Public Defender? 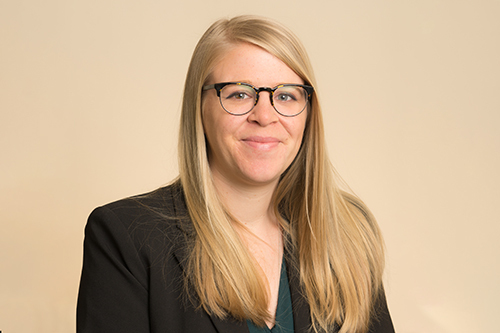 The Criminal Law Initiative hosted Johanna Leshner, JD '02, for an information session on tips to becoming a public defender. 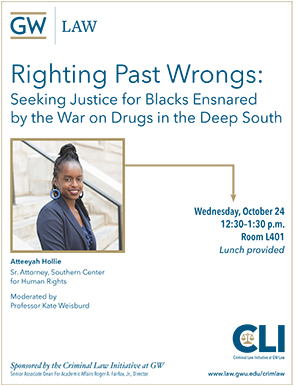 The Criminal Law Initiative hosted Atteeyah Hollie, Senior Attorney at the Southern Center for Human Rights. 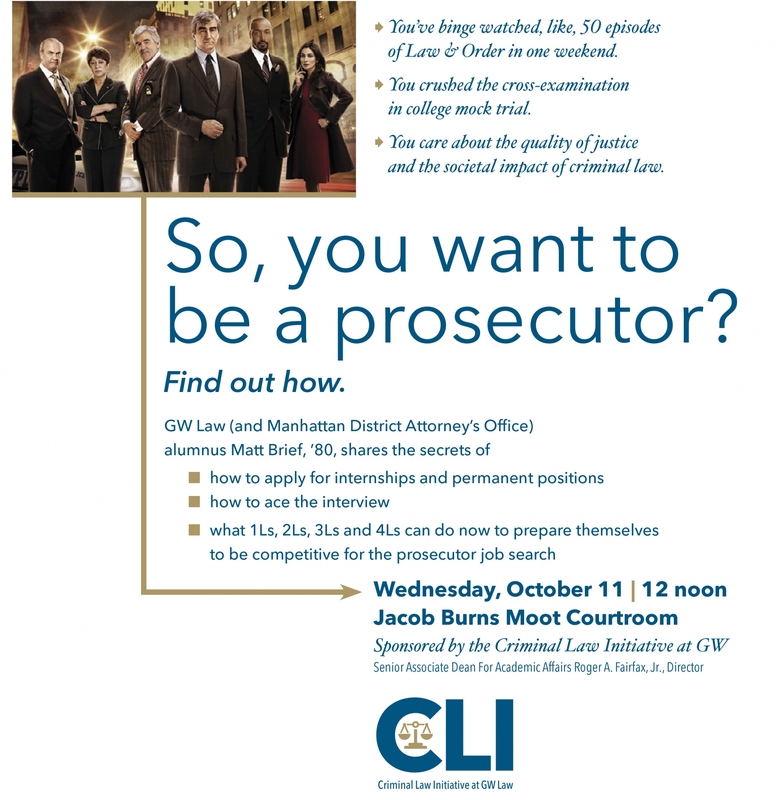 So, You Want to Be a Prosecutor? The Criminal Law Initiative as they host Matthew J. Brief, former Asst. 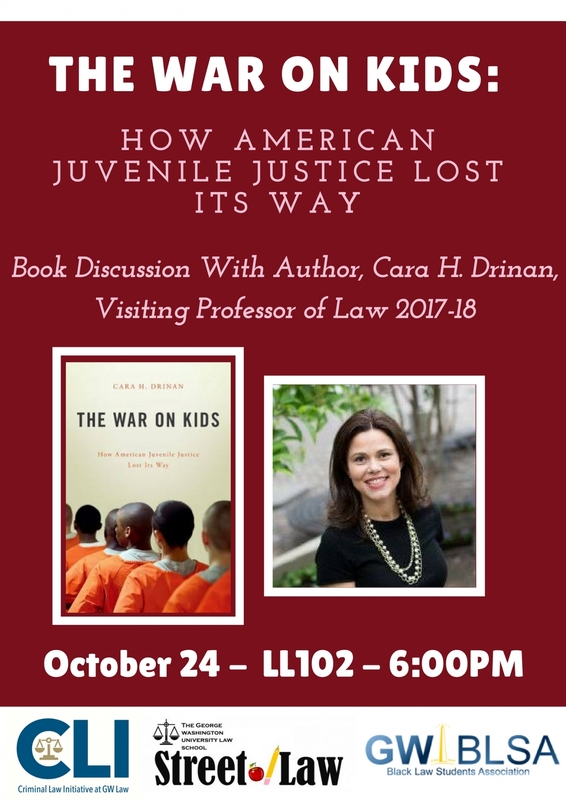 District Attorney in Manhattan and former Trial Attorney in the Organized Crime Section for the Department of Justice in the Eastern District of New York Strike Force, JD '80. Mr. Brief discussed tips to becoming a prosecutor. Gideon's Promise is the nation's primary organization focused on transforming the culture of indigent defense. 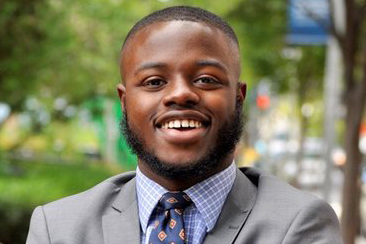 Founded in 2007 by GW Law alum Jon Rapping, Gideon's Promise provides training and mentorship to support public defenders and fosters collaboration in the collective movement for criminal and social justice reform. 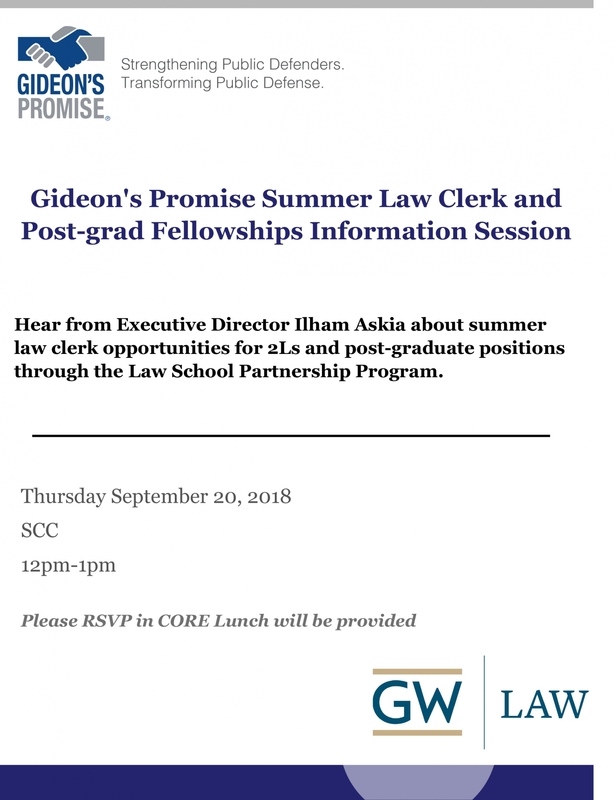 At this session, meet Executive Director Ilham Askia and learn about summer law clerk opportunities and post-graduate positions through the Law School Partnership Program. 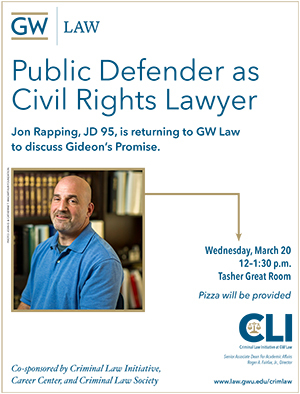 The GW Criminal Law Initiative hosted Jonathan Rapping, JD '95, Founder and President of Gideon's Promise. 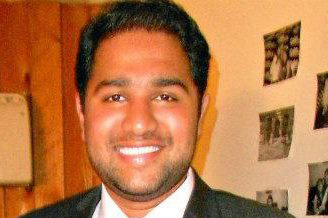 So, you want to be a Federal Public Defender? 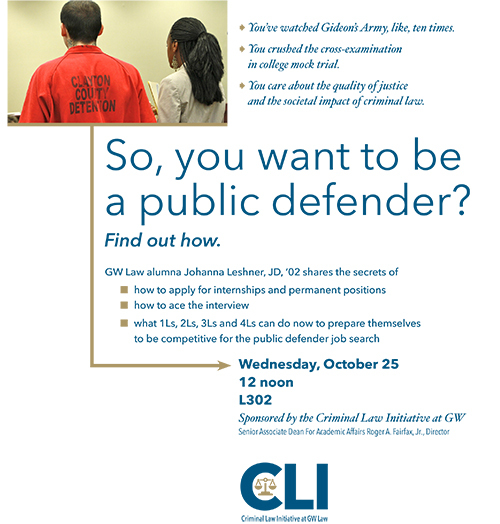 Join the GW Criminal Law Initiative as they host A.J. 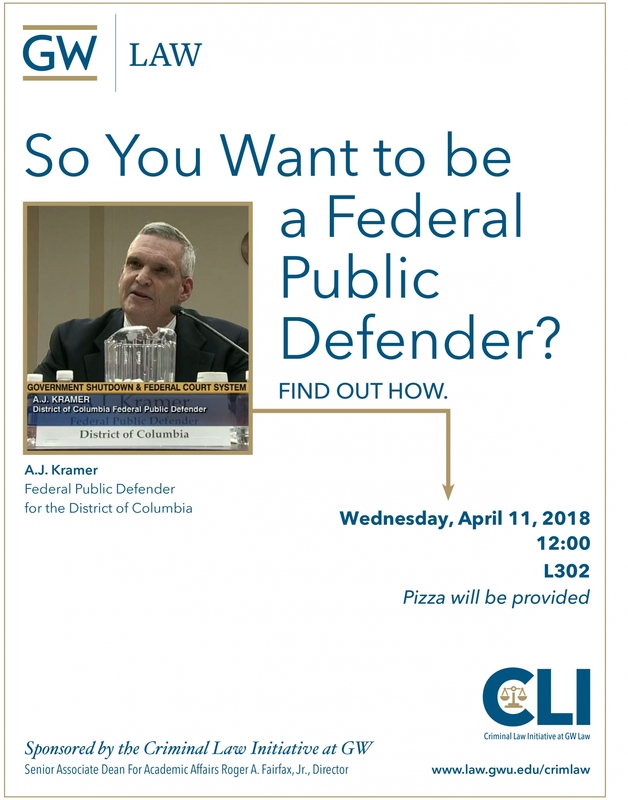 Kramer, Federal Public Defender for the District of Columbia, to discuss the Federal Public Defender career track. 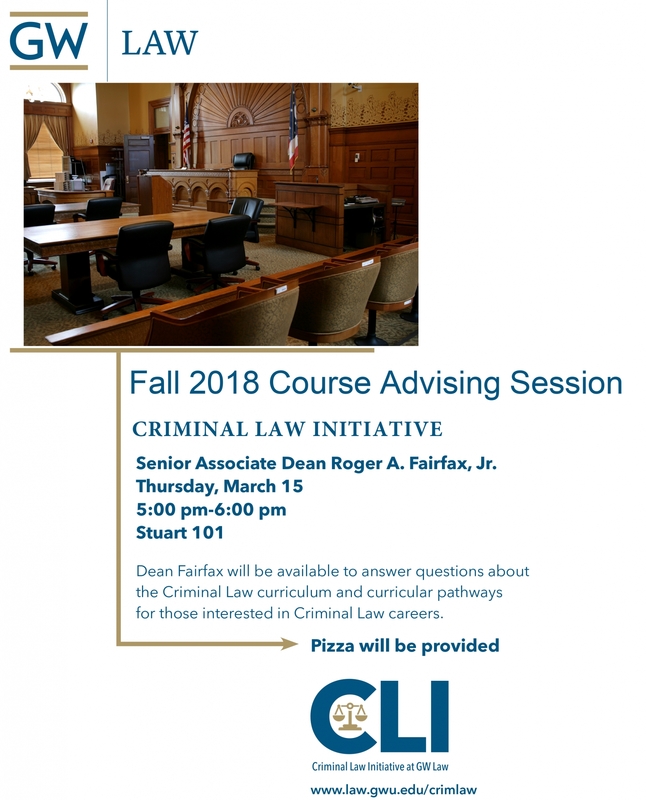 Dean Fairfax answered questions about the Criminal Law curriculum and curricular pathways for those interested in Criminal Law careers. The one-day CLE conference addressed cutting-edge FCPA issues, including the emerging legal issues in multi-jurisdictional enforcement actions, improving efficiency and cutting costs in internal investigations, qualifying for benefits under the new DOJ corporate enforcement policy, and working effectively with forensic accountants. 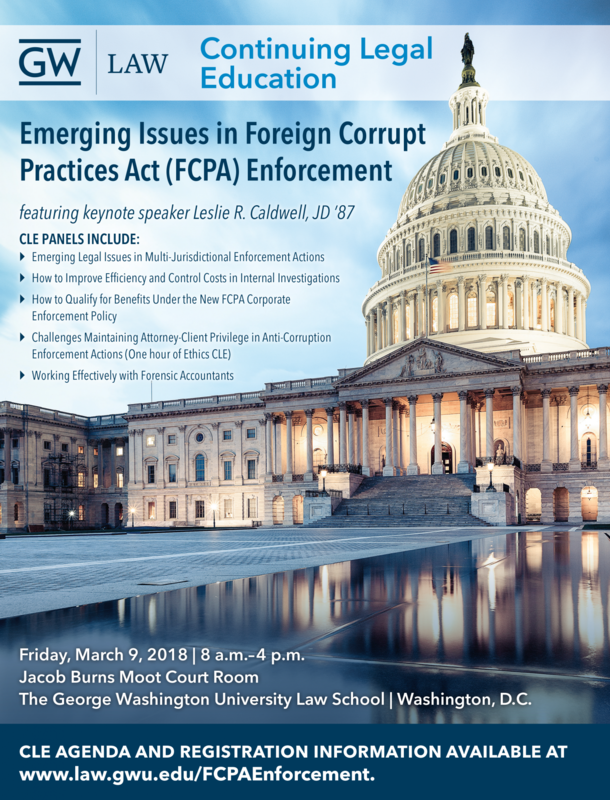 It also included an hour on an ethics topic: Challenges maintaining attorney-client privilege in anti-corruption enforcement actions. 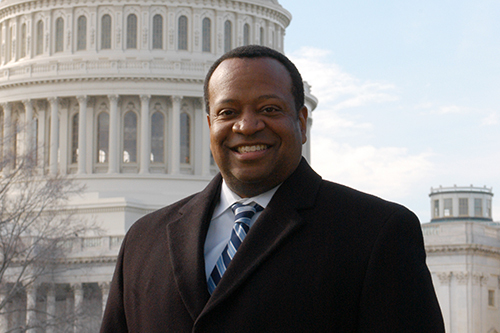 The American Constitution Society and National Bar Association examined the extent to which the ubiquity of plea bargains may exacerbate disparate outcomes for people of color, increase the imbalance in power between prosecutors and defendants, affect criminal discovery obligations, risk wrongful convictions, and even contribute to our mass incarceration crisis. 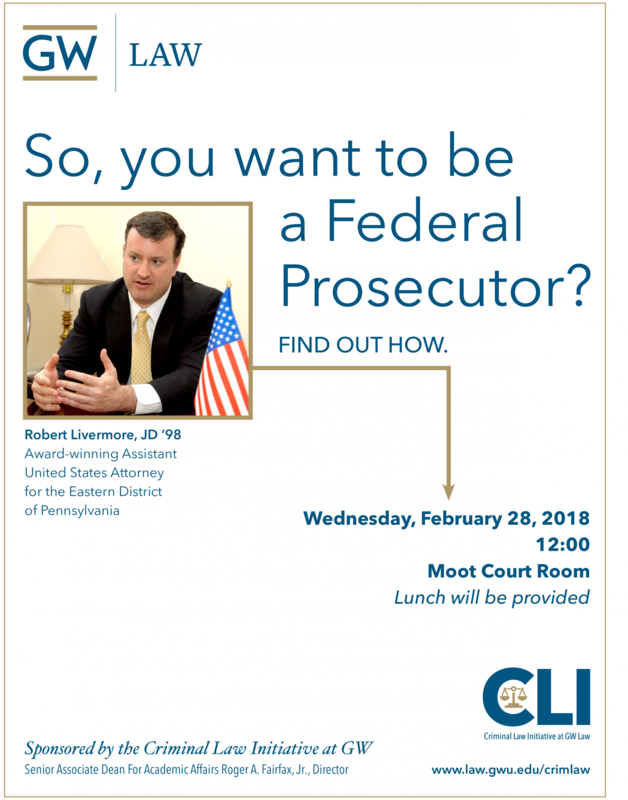 So, you want to be a Federal Prosecutor? The GW Criminal Law Initiative hosted Robert Livermore, JD '98, award-winning Assistant United States Attorney for the Eastern District of Pennylvania, to discuss the Federal Prosecutor career track. 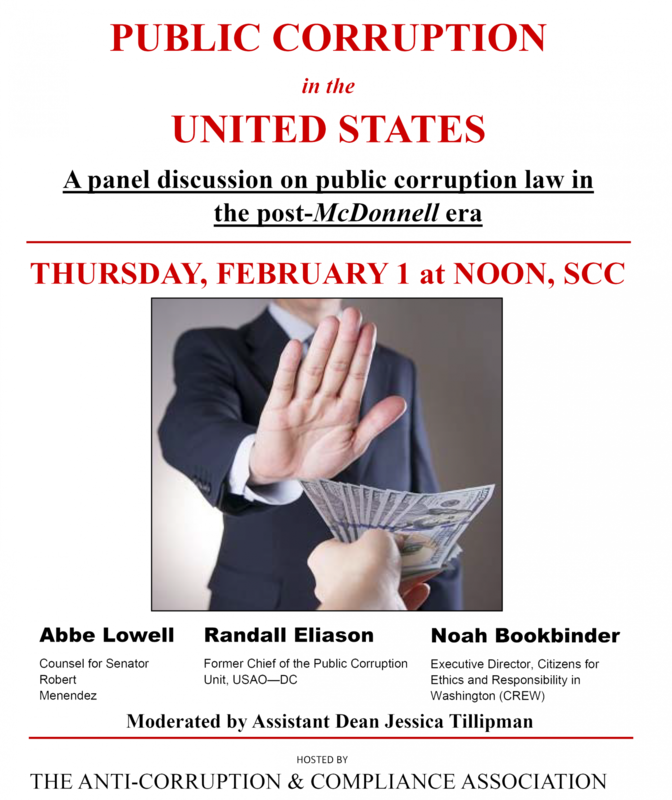 The GW Anti-Corruption and Compliance Association (ACCA) hosted a panel that debated the merits of the McDonnell case from a legal and public policy perspective. 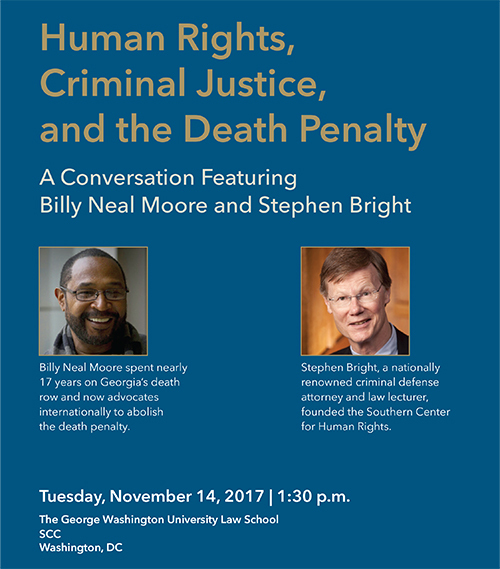 The Criminal Law Initiative, the American Constitution Society for Law and Policy, and the Southern Center for Human Rights hosted a conversation with Billy Neal Moore and Stephen Bright. 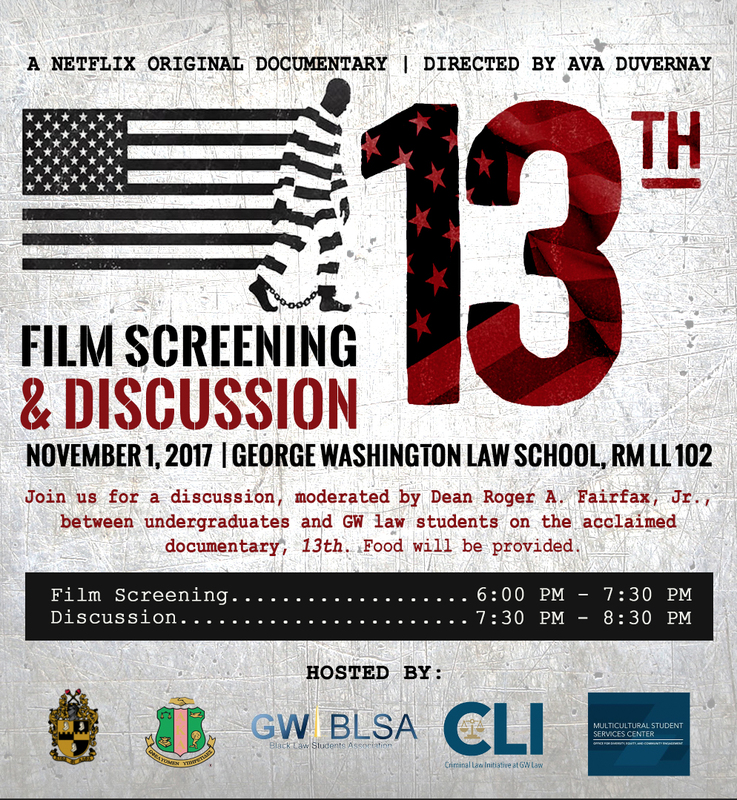 The Criminal Law Initiative and GW's Black Law Students Association (BLSA) hosted a film screening of the acclaimed documentary 13th. Students participate in a post-film discussion, moderated by Senior Associate Dean Roger A. Fairfax, Jr. 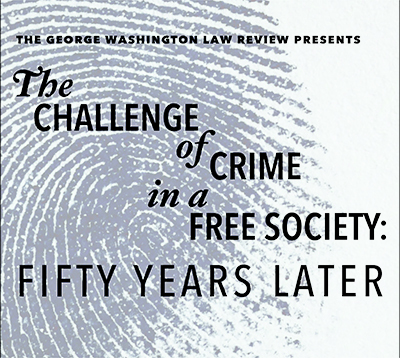 The George Washington Law Review, along with co-sponsor Roger A. Fairfax, Jr., Jeffrey and Martha Kohn Senior Associate Dean for Academic Affairs and Research Professor of Law, held its Fall 2017 Symposium, The Challenge of Crime in a Free Society: ­50 Years Later. 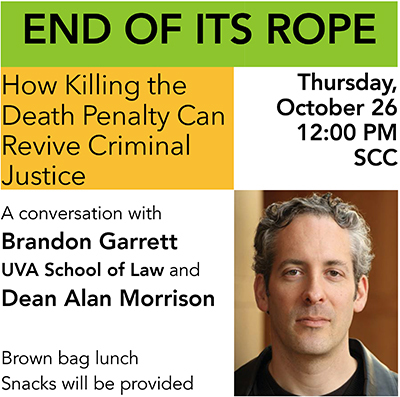 Join the Criminal Law Initiative, the Criminal Law Society, and the American Constitution Society as they host University of Virginia School of Law Professor Brandon L. Garrett to discuss his new book End of Its Rope: How Killing the Death Penalty Can Revive Criminal Justice. So You Want to Be a Public Defender? 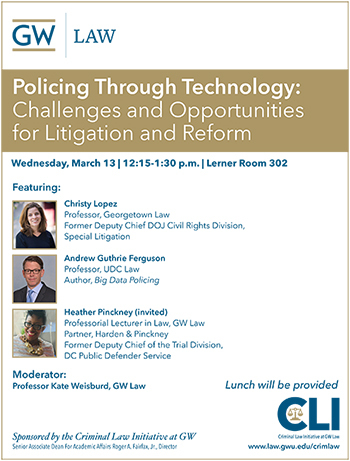 The Criminal Law Initiative hosted GW Law alumna Johanna Leshner, JD '02. Ms. Leshner shared the secrets of how to apply for internships and permanent positions, how to ace the interview, and what 1Ls, 2Ls, 3Ls, and 4Ls can do now to prepare themselves to be competitive for the public defender job search. 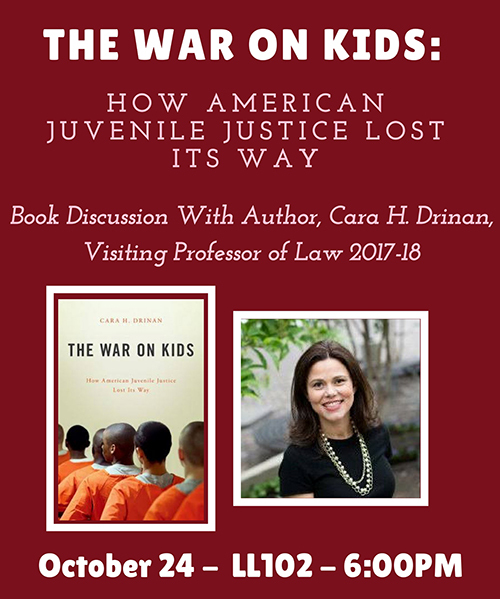 The Criminal Law Initiative, Street Law, and the GW Black Law Students Association hosted Cara H. Drinan, Visiting Professor and author of the recent book The War on Kids: How American Juvenile Justice Lost Its Way. 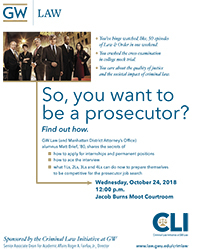 So You Want to Be a Prosecutor? The Criminal Law Initiative hosted GW Law (and Manhattan District Attorney’s Office) alumnus Matt Brief, JD '80. Mr. Brief shared the secrets of how to apply for internships and permanent positions, how to ace the interview, and what 1Ls, 2Ls, 3Ls and 4Ls can do now to prepare themselves to be competitive for the prosecutor job search. For more information about the Criminal Law Initiative, please email [email protected] and sign up for the CLI mailing list below.